Sheffield city centre is a decent sized city. From the Castlegate area down to the Moor Market, it's about 2 miles. There used to be a city circle bus route that you could hop on and off to get to different parts of town, but sadly the council stopped this late 2013. Since then, the ME has left me struggling to get around the city. In fact, it's pretty much put me off shopping in town, except for my occasional chiropractor appointment. And even then I do the bare minimum, because it's just too difficult to get from one end of town to the other. However, there is a new kid in town that just might help. Clark & Partners have just opened Mobile Sheffield, a mobility scooter hire shop in Sheffield's Moor Market. And for £4 a day, you can hire a scooter which you can use to take you all over town. The signing up process takes about 15 minutes and costs £5 for a year membership. 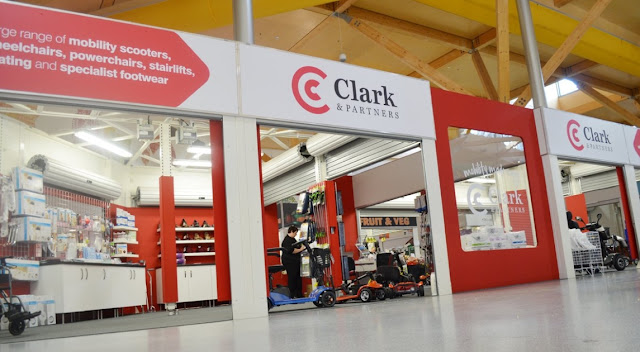 You then pay £4 for the days' hire, plus £5 deposit, refundable upon return of the scooter to Clark & Partners. Once you have signed up, you can then call up and book a scooter in the future. This means the staff can fill in the hire form so that it's ready when you arrive, and all you have to do is sign the form, pay the £4 hire, then off you go. The scooter hire process is straight forward and using the scooter was just wonderful. I was able to go to my chiropractor in one part of town, then go shopping in another. The scooters are easy to use and it doesn't take long to learn how to use them if you haven't used one before. 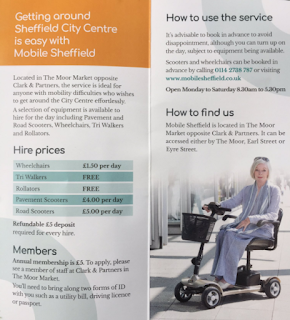 The staff are friendly and helpful, and can show you how to use the scooter, and key issues to look out for when using it around town. I would say that not all the footpaths and sections where you cross the road are great. In one case, a skip and scaffolding from some building work was sitting in the way of the footpath, and it was not wide enough for the scooter so I had to go onto the road to get around it. In many others, the dip where you cross the road was still quite high and you clunked down from the footpath to the road. This is of course not the scooters fault, it's Sheffield City Council that needs to sort these problems. I'm guessing that won't happen quickly, so you do need to sometimes go a bit further on the scooter to find a way to get around to get where your going. But at least you are on the scooter. I would still like to see a return of the city circle bus route. From a cost perspective, it costs me a bus ticket to/from town, £4.30, and scooter hire, another £4. As well as the £5 a year membership fee. Whilst I can afford this once or twice a month, a lot of people with limited mobility may struggle to pay £8.30 a day. 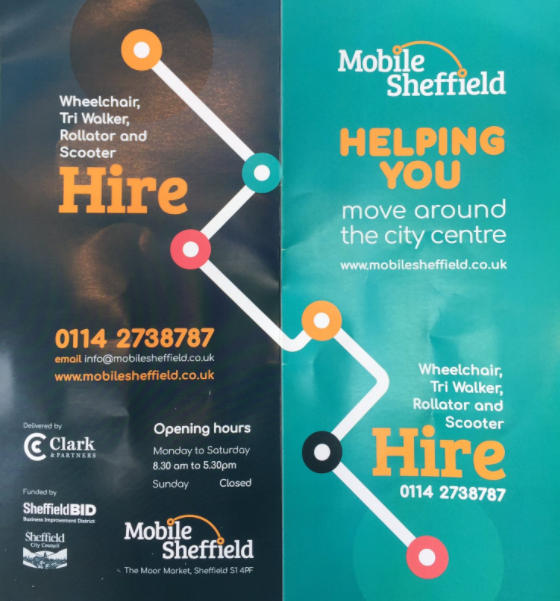 Mobile Sheffield do offer wheelchair hire for £1.50 a day, and tri walkers and rollators can be hired for the day for free, with a £5 refundable deposit. So if you can walk some distances but need frequent rests, this is a good option. I think having the city circle bus route, and the mobility scooter hire, together, would make Sheffield city centre a much more accessible, and affordable, place to shop for those of us with chronic illnesses and disabilities. Mobile Sheffield is a great initiative though, and one I warmly welcome and will continue to use. Knowing I can hire a scooter gives me the confidence to plan a trip into town more frequently than I have been able to the last few years. Do give it a try. Note: you need two forms of id when signing up. It is. Would be great to see similar in towns and cities across the country.